Hi! Welcome to our Kinship Quilters monthly quilt-along for Club 10 : Half Square Triangles in 2 Methods. This is a Block of the Month group and we will feature 2 ways to sew half square triangles to make a new quilt block each month using a Jenni Baker published pattern. If you are not signed up and would like to join, you can do so here. Our Kinship Quilters Facebook Group is on it’s second year of projects. This is suitable for a new beginner to intermediate / advanced quilter. Leaders in this group are Deanna Nagle, group moderator and testers / veteran members Jennie Peers-Barton and Chiquita Wylie. At any point, if you as a member get stuck, just visit our “hub”, the Kinship Quilters Facebook Group and tag any of these ladies with your question and someone will be happy to help as all 3 are testing the pattern ahead of you each month. We have 2 colorway kit options : A/Split Pea Stew & B/Berry Sundae. Chiquita Wylie tested our Month 1 kit in the Berry Sundae Colorway / Option B and has provided these photos for your tutorial assistance in conjuction with your printed pattern as provided via mail. The below photos represent the Option A Colorway of Split Pea Stew, and were sewn by Jennie Barton. Welcome to the 2016-2017 quilting fun! Kinship Quilters is on a new mission this year after many successful projects in 2015. Once again, we will create one-of-a-kind designs using Kaffe Fassett fabric in this group. You are going to love this simple variation on the standard 4-Patch block, the using 5″ charm squares, provided in your monthly quilt kit. Here’s a wonderful how-to video tutorial by Missouri Star! Please understand that this quilt block technique has many names including the 4-to-9 Patch quilt block. This is not referring to a “traditional” 9 patch as we quilters are accustomed to seeing, though. Instead, this refers to the block being cut in 9 new pieces. Enjoy. Once you get the hang of this, feel free to mix, match, rotate and turn your pieces as you wish. There are other variations that introduce cutting some pieces into triangles and taking the creativity a few steps further. Some of these techniques may be seen here, but be careful and make sure you’ve got down the basics of the above video FIRST, before trying. For a more extreme challenge, try this if you feel especially adventurous ! Your leaders in this group are Deanna Nagle & Ruth Bass. At any point, Kinship Quilters members may contact and tag them with questions in our online Kinship Quilters Facebook Group. These ladies have tested the pattern with our Kaffe Fassett fabric charms and have experience completing these blocks. Seen below are some examples of Ruth Bass’s experiments, the tester member for this club. Ruth is an original and veteran Kinship Quilters Facebook Group member from San Antonio, TX. Thanks Ruth! If you wish to purchase more fabric , contact Deanna Nagle at quiltedoncloud9@icloud.com or through her Kinship Quilter’s Etsy store Kinship Quilter’s Etsy store. 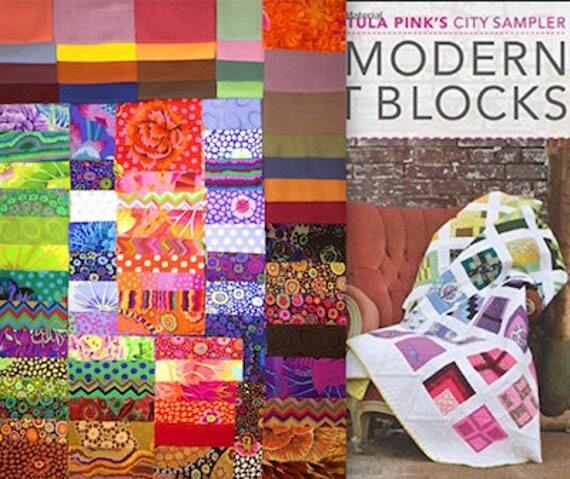 (8) 6.5” blocks per month (completing 100 blocks per year) in Tula Pink’s 100 Modern Blocks City Sampler Book, REQUIRED & provided with Registration, includes many finishing options at the end and also a variety of sizes, color-studies and more. This group will have regular tutorials and group leaders virtually on-hand who’ve sewn the whole book of patterns to answer questions and help as you go along. A fabulous study as this book is written in such a way as to allow the reader to design new blocks and record / journal progress, even “name” their blocks. This will revolutionize your quilting. Monthly Package w/ materials to create 1 of 12 sections of this 60”x81” modern quilt top each month , 22 PAGE full color GLOSSY pattern book W/ instructions FOR SIX DIFFERENT PROJECTS using these blocks is included. It also contains guidelines to use silk fabrics & (40) peel ‘n’ stick labels for use in labeling your parts while sewing this project. #10 – HST (Half-Square Triangle) Block of the Month Club: Monthly Package w/ materials to create (1) 12.5” block per month per kit, Paper Printed Quilt Booklet Provided w/ Finishing Suggestions Participants will learn one new block each month using (2) types of half-square triangle methods. Registration Fee includes specialty paper to be arrive with monthly packages Monthly Package w/ materials to create (1) 12.5” block per month per kit, this video-led-tutorial monthly class will be taught at a beginner level.